Why Care for Your Septic System? Households that are not served by public sewers usually depend on septic systems tank services and systems to treat and dispose of wastewater. A well designed, installed, and maintained septic system from Gullett Sanitation Services can provide years of reliable low-cost service. When these systems fail to operate effectively, property damage, ground and surface water pollution, and disease outbreaks can occur. Therefore, it makes good sense to understand and care for your septic systems tank system. The typical septic system tank is a large buried rectangular, or cylindrical container made of concrete, fiberglass, or polyethylene. Wastewater from your toilet, bath, kitchen, laundry, etc. flows into the tank. Heavy solids settle to the bottom, where bacterial action partially decomposes them to digested sludge and gases. Most of the lighter solids, such as fats and grease, rise to the top and form a scum layer. Septic tanks may have 1 or 2 compartments. 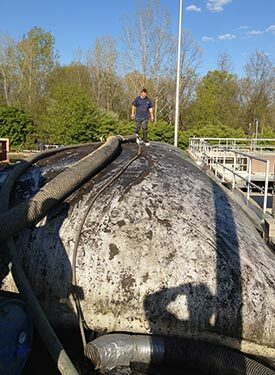 2 compartment tanks do a better job of settling solids and are required for new systems. Tees or baffles are provided at the tank’s inlet and outlet pipes. The inlet tee slows the incoming wastes and reduces disturbance of the settled sludge. The outlet tee keeps the solids or scum in the tank. All tanks should have accessible covers for checking the condition of the baffles and for pumping both compartments. If risers extend from the tank to or above the ground surface, they should be secure to prevent accidental entry into the tank. Solids that are not decomposed remain in the septic systems tank. If not removed by periodic pumping, solids will accumulate until they eventually overflow into the drainfield. Most septic system tanks need to be pumped every 2 to 5 years, depending on the tank size, and the amount and type of solids entering the tank. Checking the pump chamber, pump, and floats every year and replacing or repairing worn or broken parts. Pump maintenance should follow the manufacturer’s recommendations. Check electrical parts and conduits for corrosion. If the alarm panel has a “push-to-test” button, it should be checked regularly. Installing a septic systems tank effluent filter or pump screen if your system does not have one. Screening or filtering the septic systems tank effluent provides an effective way of preventing solids from clogging the pump and pipes. Inspecting a screen or filter, and cleaning when necessary is quick and easy, and prevents costly damage from solids entering the mound system. Why a Sand Filter System? Septic tanks with gravity flow leachfields have been used for many years in areas not served by public sewers. Unfortunately, not all soil and site conditions are well suited for these conventional systems. To protect public health and water quality, alternative systems are often used in areas where conventional systems cannot assure safe sewage treatment. The intermittent sand filter is 1 alternative, which can be constructed above or below the ground, and provides a high level of wastewater treatment. Inspecting your septic systems tank once every year and pumping it when needed. If the tank is not pumped periodically, solids escaping from the septic systems tank will clog the pump, sand filter, and drainfield. Using a garbage disposal will increase the amount of solids entering the tank and require more frequent pumping. Avoiding the flushing of harmful material into the septic systems tank. Never put grease, newspapers, paper towels, cigarettes, coffee grounds, sanitary napkins, solvents, oils, paint, and pesticides into the tank. For information on the proper disposal of hazardous household waste, call the Recycle Hotline, 1-800-RECYCLE. Avoiding the use of any type of chemical or biological septic systems tank additive. Additives do not improve the performance of the tank. They do not reduce the need for routine pumping, and some are even harmful to the system. Learn more about the right system for you by contacting Gullett Sanitation Services today at (513) 734-2227 in Bethel, Ohio, to speak with a septic systems tank service provider.